Cardiac insufficiency refers to the inability of the heart to supply the body with normal cardiac minute volume under normal end-diastolic pressure conditions. The WHO defines cardiac insufficiency according to the degree of reduced physical capacity due to ventricular dysfunction. In cases of cardiac insufficiency, there is a clear prevalence with regard to old age. While the percentage is only at one percent in patients over 50, it increases to eight percent in patients over the age of 80. The male/female ratio is 1.5 : 1. There are several causes of cardiac insufficiency. The most common cause is hypertension in more than 50% of the cases which may result in coronary heart disease, myocardial infarction and cardiac insufficiency. Other more uncommon causes are atrial fibrillation, cardiomyopathy, valvular heart diseases, high-output heart failure or pericardial diseases. There are different models classifying cardiac insufficiency according to various aspects. A very broad classification is the division into compensated and decompensated cardiac insufficiency or the classification into acute or chronic cardiac insufficiency. Stage I: The patient is symptom-free and does not show any signs of structural heart disease, but there are risk factors for the development of cardiac insufficiency. Stage II: The patient does not display any symptoms of cardiac insufficiency, but he has structural heart disease. Stage III: Structural heart disease, in combination with cardiac insufficiency symptoms, is present. According to this classification, one can differentiate between low-output heart failure (heart failure with reduced ejection fraction) and high-output heart failure (also HF-PEF for heart failure with reduced ejection fraction). The first form constitutes forward heart failure with insufficient cardiac output, whereas with high-output failure, cardiac output is increased due to a peripheral lack of oxygen supply. Depending on which chambers of the heart are affected, cardiac insufficiency may be referred to left ventricular heart failure, right ventricular heart failure or bilateral ventricular heart failure (congestive heart failure). Isolated right ventricular heart failure, in comparison, is rare and frequently occurs as a result of left ventricular heart failure causing a backflow of blood into the right chamber of the heart which results in right ventricular heart failure. A particular problem with cardiac insufficiency is the fact that insufficient cardiac output, along with insufficient blood supply of the body organs, may lead to a number of compensatory mechanisms. Among these compensatory mechanisms is the activation of the sympathetic nervous system, along with the release of catecholamines, as well as the activation of Renin-Antigiotensin-Aldosterone-System (RAAS) and ADH production. The release of natriuretic peptides, as well as cardiac remodeling and cardiac hypertrophy, are among these compensatory mechanisms as well. The problem with these compensatory mechanisms is that, while helpful at first, they will lead to a significant deterioration of cardiac insufficiency if chronically activated. The critical heart weight is, for instance, at 500 grams. If it weighs more than that, the oxygen supply of the heart becomes critical. Furthermore, cardiac insufficiency frequently leads to a loss in contractility, despite pathological myocyte growth. The clinical signs of cardiac insufficiency are variable, depending on the severity of the insufficiency. Among them is dyspnea on exertion or even at rest at a more advanced stage, asthma (cardiac asthma) and orthopnea, symmetric edema, especially on the ankles, on the tibia and on top of the foot. There is also nocturia due to nocturnal voiding of edema. Pulmonary edema, dry cough, diminished vital capacity and fatigue can be signs of cardiac insufficiency as well. Cerebral symptoms such as confusion and fear are caused by the diminished blood flow to the brain. Dyspnea and pulmonary edema are more likely caused by acute left ventricular heart failure, whereas acute right ventricular heart failure manifests itself in gastrointestinal disorders such as liver pain caused by fluid backing up into the liver which results in tender hepatomegaly. 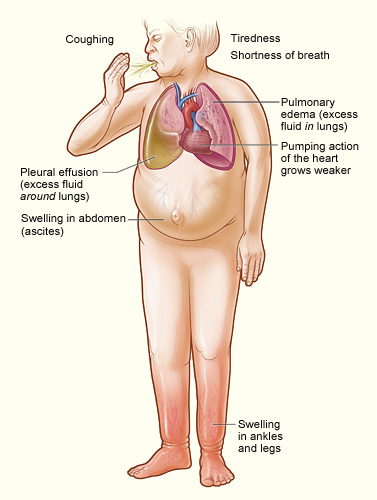 Pleural effusion, engorged kidneys with proteinuria and changes in body weight due to water retention, can also be signs of cardiac insufficiency. Diagnostic markers of cardiac insufficiency are BNP and NT-proBNP in particular, which are released by cardiomyocytes during physical exertion. Other lab tests are non-specific, and usually done in order to determine comorbidities or possible causes or to rule out differential diagnoses. Other laboratory tests include blood glucose, electrolytes, cardiac markers for myocardial damages such as CK, CK-MB and troponin, liver and kidney function tests (GOT, GPT, γ-GT, bilirubin, urea), cholesterol, triglycerides and thyroid function tests (TSH, FT4). Aside from laboratory findings, ECG and echocardiography are suitable for diagnosing cardiac insufficiency. Typical changes in ECG are cardiac arrhythmia or signs of atrial or ventricular hypertrophy. Cardiac echocardiography is particularly suitable for diagnosing cardiac dysfunctions: It will show ventricular hypertrophy, valvular heart disorders or changes in cardiac wall motion and ventricular dilatations. In addition, tests such as chest X-rays, coronary angiography, CT and MRT, long-term and stress ECG, as well as pulmonary function tests, are suitable to recognize an enlarged heart, calcifications or pulmonary congestion, and to rule out pulmonary diseases. Differential diagnosis with regard to cardiac insufficiency relate to edemas, first and foremost, which must be separated from cardiac edema. Among them are kidney and liver diseases, hypoproteinemia, which is responsible for soft tissue edema; they are more presented as non-symmetric edema in the clinical picture. Venous outflow obstruction doesn’t cause bilateral lower limbs edema and it’s better to be removed from the differential diagnosis. With regard to cardiac insufficiency, one has to differentiate between acute and chronic cardiac insufficiency, as well as between causal and symptomatic therapy. The causal approach considers the disease at hand, i.e. the treatment of arterial hypertension, myocarditis, cardiomyopathy or cardiac arrhythmia. Furthermore, revascularization in cases of coronary heart disease, as well as decreasing the risk factors, is part of cardiac insufficiency therapy. Surgical intervention, for instance in cases of a heart valve defect, is also part of the causal approach. Symptomatic therapy can be divided into conservative and medical approaches. Among the conservative measures are reducing risk factors and a therapeutic sports program in cases of stable cardiac insufficiency, as well as physical and emotional support in cases of decompensated cardiac insufficiency, respectively. As far as nutrition is concerned, a low-salt, light diet rich in potassium, is recommended. The goal is to avoid hypokalemia and hyponatremia and possibly limit fluid supply if there is a tendency to develop edema. Furthermore, medications that may deteriorate the condition of the cardiac insufficiency, such as non-steroidal-anti-rheumatic drugs (NSAR), glucocorticoids or calcium channel blockers, must be eliminated. Medical treatment conforms to the severity of the cardiac insufficiency as defined by the NYHA classification. ACE inhibitors or Antigiotensin receptor antagonists (in case of intolerance to ACE inhibitors which may cause a dry cough) are indicated as improving the prognosis in all classes. Starting with class II, beta-blockers and diuretics as well as aldosterone antagonists and ivabradine, are indicated. Cardiac glycosides (digitalis) will be used starting with class III. Furthermore, cardiac resynchronization therapy to optimize cardiac contractions, implanting a cardioverter defibrillator (ICD) or a combination of both may be sensible. The last option remaining is heart transplantation. Acute cardiac insufficiency therapy can also be divided into causal and symptomatic treatment. Causal therapy consists of, for instance, the treatment of a hypertensive crisis, recanalization in cases of heart attack, surgical cardiac interventions in cases of acute insufficiency or congenital defects, as well as the treatment of bradycardia or tachycardia. 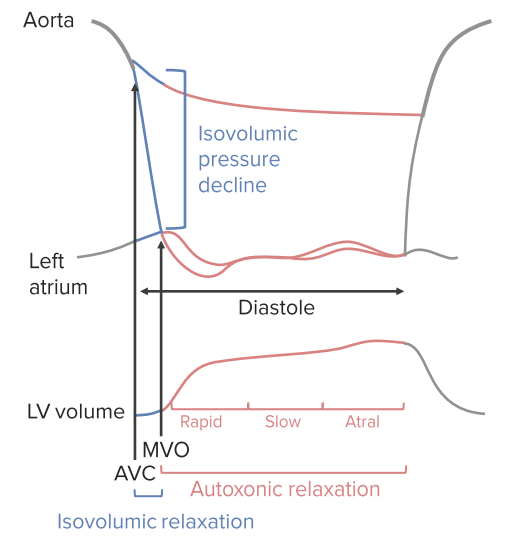 Symptomatic therapy for acute left ventricular heart failure constitutes a sitting position, sedation and oxygen, as well as preload reducing measures such as administering nitroglycerin and short-acting diuretics such as furosemide. The administration of positive inotropic beta receptor agonists, such as dobutamine, may be sensible as well. Furthermore, the goal is to control and optimize RR, CVP, and CO, even with the aid of medical devices, if necessary. Complications from cardiac insufficiency are to be taken seriously as they frequently result in death. In cases of cardiogenic shock, for instance, which constitutes acute forward heart failure with reduced organ perfusion, the mortality rate is above 50%. 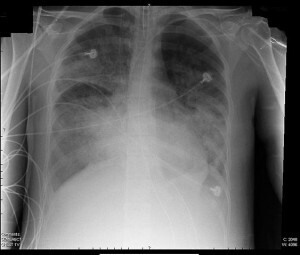 Another complication is pulmonary edema, which may cause hypoxemia. Cardiac arrhythmias, thromboembolisms, as well as chronic cardiac insufficiency turning into acute decompensated cardiac insufficiency, are other complications to be expected. Preventative measures that are suitable for cardiac insufficiency are those geared toward the most common causes of cardiac insufficiency. The goal is to avoid arterial hypertension, to control one’s body weight with healthy and balanced nutrition, as well as exercise. Abstinence from nicotine, as well as limited alcohol consumption, are preventative measures as well. Pulmonary edema constitutes the accumulation of fluid in the lungs. 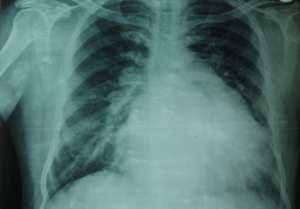 In cases of pulmonary edema, a distinction has to be made between cardiogenic and non-cardiogenic pulmonary edema, whereby the first type does not involve lung disease, but occurs much more frequently in the clinical routine. Cardiogenic pulmonary edema, also hydrostatic pulmonary edema, is frequently caused by acute left ventricular heart failure as the heart is no longer capable of adequately pumping blood from the pulmonary circulation into the systemic circulation, thus causing blood to back up into the lungs. Other causes may be aortic mitral valve stenosis, tachycardia or hypertensive heart diseases. Non-cardiogenic pulmonary edema may be caused by permeability, oncotic pressure or hypoxia. Pulmonary edema, due to permeability, may have toxic causes such as gases, or be caused by medications, i.e. 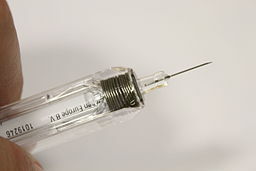 azathioprine. Other causes include infections or aspiration. 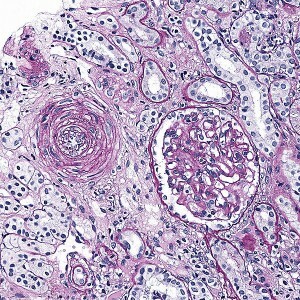 Pulmonary edemas caused by oncotic pressure have a renal origin, i.e. renal failure. Pulmonary edema caused by hypoxia is associated with high altitude (“high-altitude pulmonary edema”). Aside from the classification according to causes into cardiogenic and non-cardiogenic pulmonary edema, there is another classification according to where the edema is located. Hereby, the alveolar pulmonary edema has to be separated from the interstitial pulmonary edema. Interstitial pulmonary edema can rapidly progress into the alveolar form as the connective tissue frame of the lungs has little space for fluid accumulation. The pathophysiology of pulmonary edema is based on an imbalance of fluid reabsorption and filtration. Increased pulmonary capillary pressure quickly leads to fluid build-up in the lungs and massively impairs gas exchange, which explains the respiratory failure: Lung compliance and vital capacity decrease, airway resistance and range in path length to gas exchange increase. The pathophysiology of high-altitude pulmonary edema may be explained by a combination of a decrease in pulmonary oxygen contents, pulmonary vasoconstriction, as well as decreased alveolar pressure. Depending on the stage of pulmonary edema, symptoms may include dyspnea, cough, thick mucus discharge, tachycardia, signs of cyanosis, as well as restlessness. 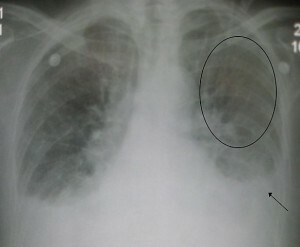 While interstitial pulmonary edema is more characterized by tachypnea, dyspnea, orthopnea, as well as sharp breathing noises (cardiac asthma, “asthma cardiale”), in cases of alveolar pulmonary edema, fear, cyanosis, paleness, and extreme dyspnea, as well as discharge, may occur accompanied by moist rattling sounds that are audible with a stethoscope. Aside from the medical history and the clinical picture, in cases of alveolar pulmonary edema, moist rattling sounds are noticeable that, in part, are already audible without using a stethoscope. Furthermore, chest X-rays and echocardiography may also be helpful. 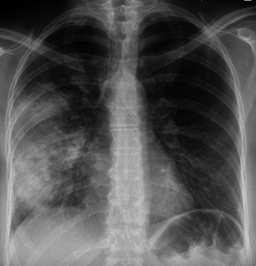 Among differential diagnosis is, aside from the all-important distinction between cardiogenic and non-cardiogenic pulmonary edema, pneumonia which is accompanied by fever and frequently by unilateral findings, as well as asthma (bronchial asthma) which is characterized, however, by dry rattling sounds. Immediate measures include, at any rate, a sitting position with the legs dangling in order to improve pulmonary vascular pressure. Sedation, administration of oxygen, as well as aspiration, are among the immediate measures as well. In cases of cardiogenic pulmonary edema, preload reduction is necessary and measures to treat the cause must be taken, i.e. treating acute left ventricular heart failure or treating cardiac arrhythmia. When treating toxic or allergic pulmonary edema, inhaled corticosteroids are indicated. Mechanical positive-pressure ventilation may also be an option. Therapy for pulmonary edema, caused by renal failure with over-hydration, consists of dialysis. In cases of high-altitude edema, it is necessary to administer oxygen and move the patient to a lower altitude. 1. What do moist rattling sounds most likely indicate? 2. Which medications are suitable for the treatment of cardiac insufficiency in all NYHA classes? Brigham, K. L. (1983). 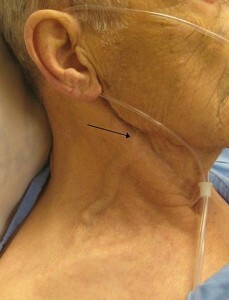 Pulmonary edema. New York, N.Y.: Thieme-Stratton. Callcutt, J. S. (1969). Pulmonary oedema. London: Lloyd-Luke. García, J. E., & Wright, V. R. (2010). Congestive heart failure: Symptoms, causes and treatment. New York: Nova Science Publishers. Martin, J., & Krum, H. (2001). The HEART FAILURE Journal Club: A review of publications on heart failure in American Heart Journal. European Journal of Heart Failure,3(1), 125-137. doi:10.1016/s1388-9842(00)00136-7. McCall, D., &Rahimtoola, S. H. (1995). Heart failure. New York, NY: Chapman & Hall. Timmis, A. D., & McCormack, T. (2003). Heart failure. Edinburgh: Churchill Livingstone. Wow! For an old Cardio Tech like me that was a great review.